Top rate would be 6.9 percent. * And speaking of screamers, I haven’t been a big fan of “A Better Illinois” for the way it handled the progressive tax rollout. But a group with ties to the Illinois Policy Institute has created a website to denounce the pro-tax group and uses fake mugshots to drive home its point. Actually, I’m not sure what the point of the site is except to tell us what we already know. They’re a group of liberals with union ties and funding. Gonna need a scorecard pretty soon with all these tax proposals. But it’s a website Rich. A website! There’s DOA, and then there’s DBA (Dead before arrival). This one’s the latter. What is does do is stretch the rubberband a little for other proposals to fit inside of. Methinks that’s what’s happening here. If the graduated tax proposal can’t get on the ballot, since Franks is opposed along with every Republican, why is Harmon wasting his time here? Won’t the millionaire’s tax be the only game in town, assuming Franks supports it? Funny how these proposals always seem to include a “tax cut” or “tax break” column comparing it to the 2014 rate, but never a “tax increase” column comparing it to the 2015 rate per current law. “Tax cut”? To clean up an old saying, please don’t pour water on my leg and tell me it’s raining. Did they take the standard deductions out of the “current” rate side of the ledger? Not sure if we are comparing apples to apples. Seems like a smart, reasonable, common-sense approach. I wonder what the fiscal impact of this is - revenue neutral from current rates? More importantly, Amanda Vinicky is looking great these days. Yowza. Way too many tax brackets……why not mirror the federal bracket & assign a tax rate to each of those income brackets? 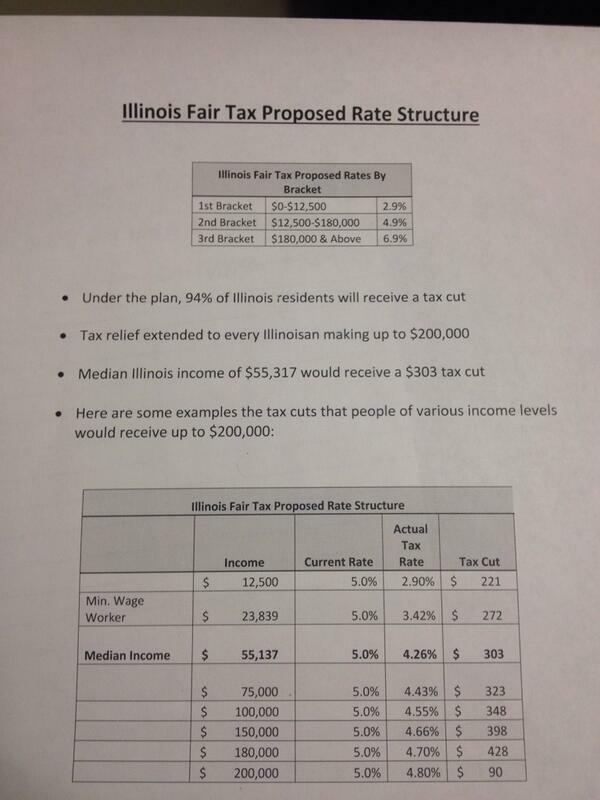 @Anon 2:58, Harmon’s Fair Tax proposal has 3 brackets. The federal code has 7. So … what are you talking about? 47 is right. It’s a website. You gotta have a website on every issue and every side of an issue. Even Pat Quinn gets it. He creates a new website with a new domain name for every issue that comes up. Next thing, he’ll have a website for each press release. Unless I don’t math: $12K is $5.77/hr. A household income of $160K or more puts you officially in the top 5% in the US. What is progressive about that? Huh? 3 brackets is “way too many”? if this is a proposed statute, it flies in the face of the State Constitution that rejects a graduated income tax in favor of a flat tax — corrupted by personal exemptions for family members. Is this a Constitutional Amendment or a proposed statute? And if a statute, is it to be implemented after the graduated income tax Constitutional Amendment passes? Harmon has a constitutional amendment that would allow for a graduated tax structure. This rate proposal that he put out there today would be the rates that would become law if the constitutional amendment passed. Capitol view- Sen Harmon understands you need to change the constitution. Not confusing at all. In neighboring states, the politicians have to be applauding Harmon. Good to see legislators proposing these tax changes. Doesn’t mean it’ll happen overnight or even this year. Once Illinois voters better understand the “how does this affect my own taxes?” relative to today’s flat tax, I hope this idea becomes more popular. Not Wisconsin and Iowa. Their graduated rates are much higher. The numbers in the chart aren’t quite right for the lower income amounts, but no one ever accused our lawmakers of knowing how to do math. Wonder how real estate taxes and sales taxes compare in Wisconsin and Iowa? Iowa state share of sales tax is 6%. Wisconsin’s is 5%. Illinois is 6.25%. Both have local sales tax option to make it higher, just like here. Just for kicks, Indiana’s state sales tax is 7%. I live in Moline,just a few miles from Iowa. Their property tax is much lower.Also the politicians are more competent and honest than in Illinois. They’re NOT a group of liberals with union ties and funding, Mr. Miller. They’re a group of liberal ILLINOIS CITIZENS with union ties and funding. Illinois has the 2nd highest property taxes in the nation, and the 12 highest combined state and local tax rate in the nation. Wisconsin’s property tax rate is a 2.07 percent compared to Illinois’ 2.28 percent, even prior to Gov. Walkers recent property tax reduction announcement. Wisconsin’s combined sales tax rate is 5.43 percent compared to our 8.13 percent. Iowa’s property tax rate is 1.6 percent and their combined sales tax rate is 6.82 percent. Both much lower than Illinois. FairTax.org should sue them for trying to label this as a “fair tax”. The FairTax is a sales tax that would eliminate the personal income, corporate income and capital gains taxes. I like that plan better. And I agree with Formerly Known As…Don Harmon’s tax proposal ignores the fact that under current law, the income tax rate will be 3.75% in 2015 and beyond. So, his plan is a big tax increase for most taxpayers.